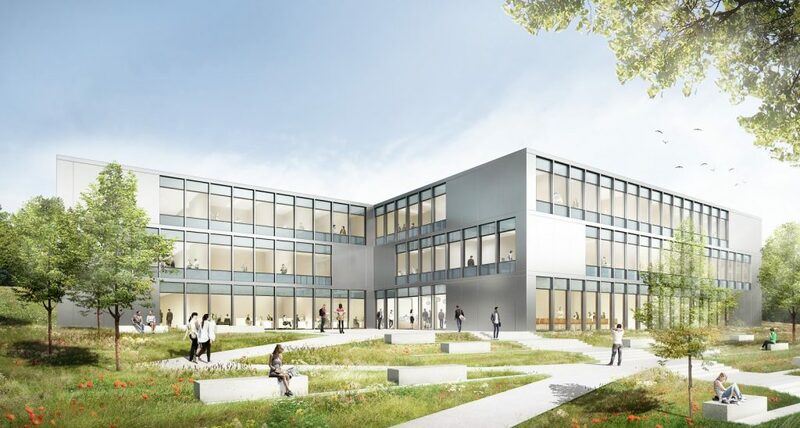 The new Preclinical Centre for Molecular Signal Processing building will be seen as an opportunity to add an important element for the overall development of the university campus in a prominent location. The structure, consisting of three modules, is oriented with its main entrance toward the campus and integrates homogeneously between both existing buildings. The proposal picks up on the existing spatial edges and its proportions are strongly aligned with the neighbouring CPIMM building. The placement of the new building skilfully exploits the site’s characteristic slope. The three offset modules are recessed into the slope to different depths, creating different lighting situations corresponding to the particular uses. A private green courtyard installed on the east side is designed as an outdoor area for the staff and offers a space for communication and scientific exchange in the midst of nature. The two frontal modules offer space for the primary functions: the laboratory and office areas as well as communication spaces. The third module is intended for deliveries and animal husbandry. Due to its hillside location, it is skilfully integrated into the landscape and situated in a protected position appropriate to its use.